Press Pass' popular mid-end racing card right of passage returns in 2011 with a retro theme! Each 24-pack hobby box of 2011 Press Pass Wheels Element Racing delivers 24 packs, 2 hits and is set to release on January 19th, 2011. New For 2011 - Trackside Treasures featuring a wide array of race-used "treasures" numbered to 99 or less. Look for Prime Swatches numbered to 25 or less! Flagship Performers (race-used flag cards #'d to 50 or less) - look for three sets each featuring a die cut of the driver's total wins, starts or championships! 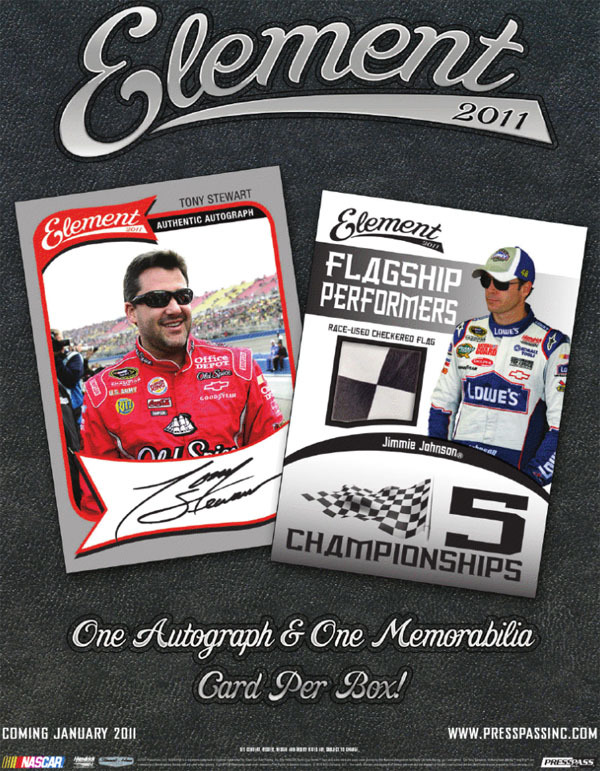 Undiscovered Elements - Bonus autographs of NASCAR's up and coming stars! Finish Line - Oversized swatch of race-used tire, green flag or checkered flag. Element Mystery Packs: Blind-wrapped box topper featuring one numbered black base set parallel card or one Undiscovered Elements autograph card!